403 Pollard - fishmonger Open-fronted style premises. 4 P Ward - fruiterer. Open-fronted premises with steel, collapsible, lattice gates; had numerous, spinning, sticky fly-strips hanging from the ceiling. 6 W P Wenzal Derek Wenzal was the lad I knew who lived in the flat over Spurriers. His dad was a director of the company. He worked in Cato's as his first job and used to have one of those delivery bikes with a carrier on the front. There were two brothers, John and Derek, and two daughters. The elder one, about my age, was Eileen, the much younger one I can't remember. That's old age kicking in. I am 79 now (2016). My younger brother Tony lives in Chestnut Avenue Pinner and one day he discovered Derek Wenzel lived at the bottom of his road. That was strange. 9 Catos (on corner) - hardware We used to buy our paraffin, Aladin Pink, here (see "Laings homes - heating" section). Numerous refilled 1 gallon paraffin containers, with their long spouts, were stood in a line just inside the door. You needed to be vigilant and check that the container that you were offered for collection was not in worse condition than the one that you had deposited a few days earlier. - E.B. Belmont and Kenton Lane - A ‘cow field’ was opposite the end of Beverley Gardens and is now the site of St Joseph’s Children’s Centre. Thinking of Kenton Lane and ‘cow fields’, I seem to remember there still being a small ‘token herd’ of cows at Kenton Lane Farm, home of J H Braziers dairy around 1960. I think that I still have one of their milk bottles in the loft. I worked in my school holiday in 1957 at Preston Road Dairy (R F Brazier) where we put cream from Kenton Lane Farm into cartons and milk from Carpenders Park Farm, Oxhey Lane (S A Brazier) into bottles. I guess all these small dairies have now been swallowed up. During my time working in Kenton Lane during 1960-61, I was a trainee surveyor for the building of, what is now, Magnolia Court. Our site office was the old newsagents (previously an estate agent’s office) that stood on the corner. I remember taking my air-pistol into work to shoot the rats that sometimes showed themselves in the office during quiet moments when I was there on my own. To the west of the bridge, were fields either side of the road, with cows grazing - no fences. During the War there was hardly any traffic and, if they wanted, cows could just stray across the road. The railway line ran along the eastern edge of the field. At the far end of the field was a pond where we used to catch newts etc. We often played in the cow field. One morning, after an air raid, we found big bundles of chaff. These comprised paper strips 1 inch wide, black one side, silvered the other. Chaff was dropped by german bombers to confuse our radar. There was a large builders’ site-office belonging to Ruddock and Meighan on the verge near the cow field gate. It was about 25 x 12 feet and had dozens of 12 x 12 inch window panes and was not used in the War. While Belmont station was being constructed - during 1938/9 - a temporary platform comprising a long concrete strip was built on the south side of the bridge. It was still there years later… and indeed may still be there. c. 1950. © Peter Ault. Both to the north of the station and also to the south of the temporary platform a few metres from the main track and parallel to it, were 'sand trap’ brakes - short sidings in which the rails were covered by sand (retained in long, open-top boxes about 18" wide & deep). If a train didn't stop and give a key to the signalman, it would be diverted into the sand trap (about 100 yards-long… with buffers). This was to prevent a head-on collision with an oncoming train. The errant train was to slow down gradually and hopefully stop before the buffers. As far as I know they were never used. We used to make sand castles etc., until the porter came under the bridge to shout and shake his fist at us. We would retreat to my friend's back garden for 10 minutes then carry on playing with the sand. In the war we couldn't go to the seaside - the beaches were mined. Playing in these sand traps was the next best thing. Mr Cotton worked in the ticket office. The Cottons lived above 'Bees and Tees’, the grocer, opposite the railway booking office. When her husband was on late shift, Mrs Cotton would take supper over to him. One evening she came out of booking hall, looked up, only to see flames coming out of her kitchen window. Rushing back she found her little boy had thrown lighted matches out of the window. One must have blown back and set light to the curtains. We sometimes used to sit on the bottom steps of the level crossing (in a cutting between Belmont and Stanmore). Since we were precariously close to the track, the engine driver would squirt hot water at us to make us go away. We also put coins, nails and other small things on the line - unlike today when they put on chunks of concrete, trying to derail the train. 500 Belmont Fisheries; Pollard’s Fish Bar Open-fronted with steel, collapsible, lattice gates; retained the original, marble slabs. 498 Pearks - grocer; Vivienne-Ellis - gift cards, jewellery During WW II, metal parts of a tank trap (comprising bent railway lines) were normally stacked on the pavement between numbers 500 and 498. When in use, they were intended to slot into the road, but when not deployed (by the Home Guard) were stacked against the concrete part of the trap (on the pavement). The Circle in 1940-ish - from H/H, Volume 3, page 28. Continuing round the Circle from "Pearks Corner"… as it’s named here. The Circle c.1950 taken from the flat above Spurriers. The bus shelter has attracted a few moist customers. Copyright Peter Ault. 16 Walker - fruiterer and florist. My mum preferred Walkers rather than Wiffen Bros (next to Williams Bros opposite the cinema). Most greengrocers used to boil the beetroots out the back. They took hours to cook - producing great clouds of steam in the process. In the winter it looked like the place was on fire. During the War, huge queues used to form when bananas came in about once a year. - John Collier. 23 Boots - chemist - ideal for chemicals e.g. sodium chlorate (for pipe-bombs) - EB. 25 F W Woolworth & Co. Ltd. Double-frontage. "Sand bin" corner. (The weird looking device, bottom left, is the top of a gas street lamp). Only two cars? That was our world pre the mid-1950s. - Copyright Peter Ault. During the war, where the garage is now, there used to be a sand bin. It was a heavy iron construction - looking like Brunel made it - about 8 x 3 and 3ft high with a very heavy iron clasp, but no padlock. It was galvanised, but the salt in the sand had corroded the bottom panels. The sand was for the circle road when it was icy in winter - but, when it had no sand in it, one of us kids would hide inside with the catch fastened. You could just see out through a gap. When people went past, the occupant would call out "Help, Help" while others watched from behind the stinging nettles. The shocked passer-by would ask "How did you get in there?" "Some boys put me in here." came the reply, as we all laughed our heads off whilst hidden. Then it was another's turn in the bin. Good, harmless fun. Belmont Essoldo cinema - earlier 'The Plaza’. Long queues formed outside The Plaza, running back down Kenton Lane, when films like Bambi, Snow White and Fantasia were on. Next to The Plaza cinema (my mum was a cleaner there), during the war, was a big static water tank 40 x 40 x 5 feet for the fire brigade. When the fire brigade filled it they had hoses across the road from the circle. A man came from Weston Drive on a bike. He didn't ride over the ramps put down for cars, but thought he could ride over the hoses, thinking they would squash. His bike hit the hose, stopped, threw him over the handlebars and he landed on his head with a sickening thud. I remember he was bald. After about 30 minutes he recovered and went on his way - knowing a little more about hydraulic pressure. There were also smaller, round concrete tanks 6 x 5 feet deep which were placed at the flat's entrances by the tank-traps and next to Glasses butchers. After the war they were emptied and stored in the alley in Kenmore Ave. A little girl from the first house was playing in one. She had her fingers under it when it rolled and crushed them - I think they were saved. Her name was Sylvia Sparkes; her father owned a hire car firm. Opposite The Plaza was The British Restaurant and Alf's Café. Alf’s Café, if you remember, had boards by the counter with wide gaps. If you dropped money you lost it. We used to say Alf got it later when closed. One evening we looked through the windows and saw a navvy sleeping on a table. Once we saw Alf being carried back to the cafe absolutely drunk. He'd been to a wedding do at the Belmont Hotel. I lived at 119 Bellamy Drive Stanmore, just off Western Road, close to Belmont Circle. Sidney and Dorothy Winter lived in the same road which was handy for the Essoldo Cinema where they had their studio. I learned my dancing there fairly well and often entered dance competitions. There is so much I know of the Belmont Circle area - from dancing in Sid Winter’s dance studio at the Essoldo to the grumpy bloke in Cato’s who you mentioned, John. I did laugh at that. There is so much of interest here for me, John, but especially your mention of your mother working at the Plaza Cinema, later the Essoldo. My mother worked there for years, firstly as a cleaner, then as an usherette too. She also did relief work in the ticket kiosk with a Mrs Huntley, but I cannot remember when she started there. Probably just after the war, I think. I recall she mentioned a fellow cleaning lady a Mrs Hartley (Elgin Avenue) and a Mrs Collier, possibly your mother. I think I watched every film they ever showed because mum used to have free tickets and let me in anyway, if Mr Duncan (the manager) was not looking. Mr Duncan was a rather dapper man who spent most of his time in his upstairs office. The little man tearing tickets was the odd job and boiler man. His name was Wally something? He was a big drinker and once fell down the stairs top to bottom when under the influence. I do not suppose you remember any of the chaps from my road when I was young but I kept in touch for years with a lot of them and still do. We used to play a lot on the Circle at Belmont because running in and out of the bushes was such fun. We also played at the level crossing as you did doing the same things. Pennies on the line etc.. We were not too well off during the war so I didn't flatten too many pennies. We played roller hockey on the street. That was super fun but our main interest was football. We played on a patch of ground close by the railway level crossing near Vernon Drive was it ? You mentioned Dirty Dicks Cafe in Kenton Lane and I well remember the bread pudding he made was incredibly good. This picture, taken opposite the Essoldo, Belmont, demonstrates the limitations of my tiny camera. I was standing behind my friend sitting in a tree. The lens flare is so obvious!! We lived close to the Weston Drive end of Bellamy Drive, so about seven houses away from the V2 rocket which fell on Uppingham Avenue in about March 1945. My brothers and I were in a 'Morrison’ shelter inside the house. It was a sturdy thing with cast iron corners, a thick sheet steel top like a big metal table and thick wire mesh around the sides. We slept in it every night from when the V1s started to fly over. They were more terrifying than the V2s because you could hear them until the pulse jet cut-out. Then you just waited... ... ... ...BANG! We always prayed it wouldn’t land on us, and it didn’t until the rocket in the last few weeks of the war. There were lots of near misses though. The explosion left us dirty and covered in glass but unhurt. The front of the house was badly damaged and we found the front door at the top of our stairs. I remember the emergency services used a yellowy oiled canvas type of material to cover where the glass used to be, that was about two days after the bomb. Weeks later they took out the frames and replaced the windows completely, as well as other essential repairs. The centre of the parade - as depicted in a 1934 Laing’s Estates brochure. 23 Express Dairy (’38); Broadfields - double-fronted (with no. 22) car-accessories and tuning (e.g. Peco exhausts, alloy wheels) - the entrance to one half of the pair of premises was blanked-off. 14, 15, 16 The London Cooperative - triple frontage - butcher, groceries, baker. "What’s your ’divi’ luv?". One’s family’s six-digit ’divi’ can be retained in memory for a lifetime - and, for Gillian Gamblin, née Bailey, her neighbour's - for whom she used to shop - divis remain imprinted too! Station Road Edgware, 1920s - Image courtesy of Britain From Above via pinimg.com. Looking south-east to Edgware Station (opened 1924) and, a partially developed, Station Road. Crossing over the Charing Cross, Euston and Hampstead Railway (CCE&HR) (now Northern Line) at the top right can be seen the LNER/GNR line to the other Edgware station, 300m to the south-west. In the bottom centre of the photo, excavation work for the 'Northern Heights' extension has been started. Another view, from the air, taken in 1926 - courtesy of The Francis Frith Collection: Looking east towards the rolling fields of … … eastern Edgware. Edgware Station (now Northern Line) is bottom-right. A few advertisements by Edgware’s traders appear in the Whitchurch parish magazine. See 'Parish Magazines' at the foot of the page. 67 The Ritz Cinema … more and more (from Flickr). A film clip of the opening ceremony. 69 Maynard’s - confectioners… and the cinema frontage (1932). Stanley J Lee - Haberdashery, (from whence came most of my hair ribbons) and general department store. The money taken whizzed round the store to the cashier in little cash carriers, on a wire at ceiling height, and a carrier then brought your change. Set back from the road was the LNER station (looking east) - c.1905 and sidings. Adjacent to the station and sidings, were arrayed coal yards - one of which belonged to 'Herbert Clarke & Co'. 1926 LNER station complex from the air, looking east towards Mill Hill. This fascinating, detailed image from 'Britain From Above' shows the rail tracks from Mill Hill splitting into six sidings in addition to the platform. Freight handling, on the five right-hand sidings, appears quite significant. The newly-constructed underground line crosses under the LNER line. In the distance are the several arches of the bridge carrying Dean's Lane over the railway - it looks as if there may, at one time, have been a plan to extend the sidings adjacent to Banstock Road. Station Road runs at the bottom of the image. The Tudor-style 'Railway' Hotel emerged a few years after this picture was taken (ie. in the early '30s). The Ritz cinema would eventually be erected where Manor Park Crescent meets Station Road - at the very left-hand bottom corner of the image. The station and its environs, also from 'Britain From Above', looking west to the wiggles in Whitchurch Lane leading to the Canons Park-land and a bare Whitchurch Gardens preparing to encircle Edgware Tennis Club. Hey, look at that… straight down Canons Drive - leading to the North London Collegiate. The crane (adjacent to the engine shed), being a relatively substantial artifact, was still there in Nick Catford's photo of the goods yard taken in March 1975. In the 50s, behind a long picket fence, a large shed in the freight yard, housed ex-WD premises, Mullards. The yard used to sell motor cycles, clothing, tools and other ex-WW II, military, bric-a-brac. In the 60s, a timber yard was housed in an adjacent large shed. Retailers in Edgware High Street in the early 1900s. Edgware High Street at the junction with Station Road and Whitchurch Lane, looking north along the tramway up towards Stonegrove, 1924. 1 Edgware and Stanmore Electrical Co.
845 Scottish Fisheries, John Dory’s Ltd. Fish and chip shop with a large neon sign hanging outside … boy scouts used to buy a thrup’ny bag of chips and a pickled onion after scout evenings (held in the huts 300m further down Honeypot Lane). Then, in the early ’60s, the property was taken-over by ‘Greys’ for a double-fronted bathroom-fitting showroom and plumbing and tools. 857 Smith and Weston Ltd - ironmonger a traditional ironmonger - with plenty of delights to fascinate kids. 863 Elizabeth Grant - ladies fashions. Mrs Goodban (lived in Merrion Avenue) was enlisted to hire local schoolboys to deliver, along with her sons, flyers for the shop’s ‘Spring Sale’ - usually held in May. Remuneration? - about 1d per flyer (1 flyer per letter-box). 901 J Sainsbury Double-fronted. Three marble-topped counters ran along either side, with a raised cashier’s booth at the far end. Obertelli - ice cream parlour. Ice cream was produced in a small dairy at the rear of the shop. We lived in Honeypot Lane. Opposite the playing fields, where the houses are only one side of the road, one of the houses had an oil bomb drop on it. One could see it from the pavement - the garage door was all stained black. It was very lucky there was no fire. One night, opposite our house in Honeypot Lane, the whole playing field was covered in flares trom incendiary bombs. That was the night they bombed Polyfotos in Dalston Gardens - there was pieces of film floating about and burning paper etc. Polyfoto's Head Office was located at 11-12 Dalston Gardens. One evening, when it was dark, the air aid warnings went and shortly the familiar sound of a German aircraft was heard… and I think searchlights were sweeping the sky. German aircraft were identifiable by their twin engines not being synchronised - this produced a distinctive beat sound. Then there were explosions as bombs hit the area. Shortly after a glow was present in the factory area which was Dalston Gardens not far from my house. Very soon further explosions were heard and the glow turned into an inferno. They'd hit the Polyfoto factory, which at that time was the only one in Dalston Gardens, and the contents, which were highly inflammable, went up like tinder. By now the sound of fire engines and rescue vehicles could be heard. The fire raged and lit-up the entire area. This went on till the early hours of the morning, when us kids went up there, and amid the lingering smell of burnt film, picked up loads of charred pictures which littered the area. We lived in Honeypot Lane. The sirens had sounded and things were quiet. I went upstairs to look out of the back bedroom window which faced down the gardens of Wigton Gardens toward the Bakerloo Line railway embankment and saw a flickering light in the sky approaching low over the railway embankment. By now there was a deep rumbling sound which was getting louder. The next thing I can remember the thing came into view just over roof-top height making it's characteristic rumbling sound and continuing over Wigton Gardens... then silence. I rushed out onto the landing and grabbed hold of the two uprights between the bedrooms. My mother, who was also upstairs at the time, dived under the bed. The deathly suspense was the scariest thing. Where will it come down? The next thing I knew was a terrific explosion, the house shook and, when we recovered and ventured downstairs, there was glass and what was left of ornaments everywhere. The curtains were shreaded and blowing outside… and the sound of rescue vehicles… and people rushing about. A V1 flying bomb had come down on Pearswood Crescent. It claimed many lives. All the victims were placed in a mass grave and listed on a memorial in the cemetery at Harrow Weald near The Leefe Robinson public house. The only boy I knew in Pearswood was a Peter Dossel. When we subsequently visited the cemetery, one of the graves bears that name. - Roy Young. 391 Queens Radio and Electrical Co. I have many fond memories of the Dansette factory in Honeypot Lane as I worked there as a tester/ alignment engineer on various production lines. I remember one chap was wrecking every autochanger on the line because he forced the overarms instead of pushing them down to take them out of the transit position. They were crap though. I remember we started to make a Prinzsound stereo for Dixons that smoked when it was played very loudly!! The transistors used just weren’t up to the job and went short-circuit. Some of the Perdio radios were also made there. 180 H T Calvet - news and tobac. The Queen of Hearts Hotel The Queen of Hearts Public House was a bit of a Gin Palace, in that it attracted lots of American servicemen because it had a ballroom at the back. Every week-end a band would play, and myself, and a few other children, would sneak around the back in the summer to watch the Yanks and their girlfriends jitterbugging (an early form of jiving) through the large glass windows. One day a very drunk Yank pulled up in the car park in a jeep. When I asked him if he had "got any gum, chum? ", he produced a gun, waved it at me, and told me to "F... Off". Later that evening he was arrested for firing at, and missing, a fellow soldier. I never told my parents as I quite liked to listen to the music. We kids were allowed quite a lot of freedom during the war. Exciting times! - Neon Harrison. ("Credit drapers" - these merchants apparently sold curtains and ladies’ & gentleman’s clothing to low-salaried families on credit terms - periodically collecting re-payments. Sometimes known as ’tallymen’, credit drapers ostensibly sold clothing etc. but their true income was from the credit business - a forerunner of the ’catalogue shopping’ industry. In the summer of 1944, as a 10 year old boy, I lived at 181a, Streatfield Road, above Cut and Quality Grocery Store. One day I was standing just inside Posner's Gown Shop doorway when I witnessed a dog-fight between an English 'plane and a German V1. I must explain that Posners had a deep doorway with wedding gown and dresses on models each side; with strips of tape on the glass to prevent splintering in the event of a blast. The glass was beautifully rounded as it curved to the doorway. The doodlebug phut-phutted quite slowly along in a westerly direction when suddenly an English aeroplane who had been shooting at it, appeared alongside the rocket and tilted the wing of the 'plane to the wing of the V1 sending it into a steep dive. The pilot had intended to force the weapon to crash into Centenary Park, near Chandos Secondary School, but it crashed into some houses causing some deaths. The blast of the V1 was such, that the windows I was in front of convulsed, but didn't break, although several shop windows in the parade did break. I understand that the pilot of the 'plane came to the area later to apologise and explain what he had tried to do. At the end of the war, we kids had a street party in the service road in front of Woolworths, with a bonfire that caused the tarmac to melt. Exciting times! I used to belong to The Kenton Road Cycle Racing Club. We used to congregate outside that tiny little shop - no front door. The girl who used to serve the ice cream there used to have to enter the shop using the back door. 254 English Meat stores (’38); vac. The Broadway in the early '60s - looking East towards the Marsh Lane junction. 1910 Stanmore Hill - looking north, up the hill - and south, down the hill past the junction with Green Lane and, 100 yds on the left, The Abercorn Arms Royal Hotel. Several advertisements by Stanmore’s traders appear in the parish magazines. See foot of section. 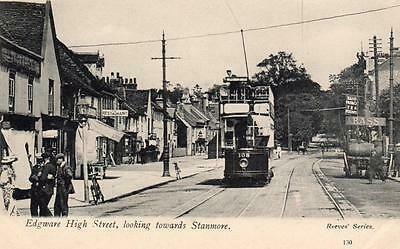 Michael Pierce’s blog has several references to Stanmore Village in the 30s and 40s. Stanmore changed for ever when it became the location of choice for the AA’s head office in the late ’50s - a new "tower block". My Dad used to pop-in there for routes when we went on our holidays. Now it’s gone and is replaced by a huge Sainsbury’s which has the most ludicrous aisle layout because of the building's strange shape. - Jonny Richardson, 2010. W H Cullen - groceries In the 50s, this was, to me, because it retained its traditional interior, Stanmore’s most memorable emporium. The pervasive aroma from the slowly rotating, coffee roaster positioned in the right-hand window wafted through a vent into the street… and the animated, butter-patting antics - rolling and flipping with grooved, wooden ‘hands’ - on one of the counters behind the roaster, were mesmerising. - Colin Poyton. 55 & 67 Unett & Platts Ltd - motor engnrs This photo from, what may have been, the late 1930s, has been unearthed by Jo Hooke in her late uncle's, Harold Barns, photograph album. National Benzole, Shell and Esso Ethyl pumps feature. 18 Phillips & Cooper - bldg. contrctrs. 18 Bannerman & Co - tobaccnsts. 18 Fredk Baker - hairdrssr. 9 The Prudential Assurance Co.
37, 39 Neil - conf and tob. 2 Franklins Coals; upstairs: Lawrence Roth - dentist The spartan ground-floor shop front only offered a poster promoting smokeless fuel. Rossi(e)'s Cafe … although I am sure it wasn't quite spelt that way. 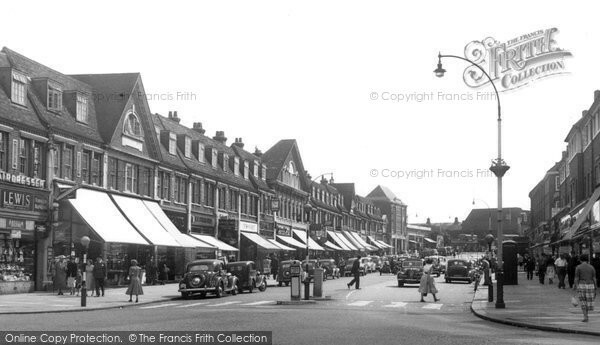 30 Stanmore Filling Station My father was David (Dave) Smith and was the ‘Smith’ in ‘Sawford & Smith’. The garage was actually down a lane at the side of Stanmore Filling Station and situated in what, I think, were the stables of Regent House, belonging to Dr Woodhouse. I think my father and Arthur Sawford started the business in about 1947, and it closed after Arthur's death in about 1962 or 3. The place had a distinctive smell of engine oil and I can never remember going there without getting some black grease stain on my dress. A low resolution photo of a "Rattler" at Stanmore Village Station in 1934. Image via Brenda Kock. '142' Omnibus passes The Abercorn Arms Royal Hotel c. 1918. A number 142 omnibus passing The Vine. An LGOC B-type omnibus at the top of a bleak-looking Stanmore Hill. Time: midday, summer (high sun, open windows). Date: undeclared - but, since 'B-types' were not introduced until about 1912, the image probably dates from the period of WW1 (before official 'bus stops' were designated). Route: High Street Watford - Bushey - Stanmore - Edgware - Kenton - Cricklewood Bdy - High Road Kilburn - Cambridge … and Kilburn Park. If you don't recognise the acronym 'LGOC', London General Omnibus Company, that was because it became defunct in about 1912 when the company was subsumed into AEC (of Aldenham Bus Works fame). The plethora of slats in front of the rear wheels may have been an early 'health & safety' feature to minimise the risk of hapless individuals falling foul of the rear wheels (as deployed on trucks today - but, in their case, the main beneficiaries are errant, low-bodied vehicles and their occupants). As bus body shapes evolved, there was only need for a single slat eg. on 'RT's of the mid-20th Century. The ad. on the side? 'Photoshop' allows one to discern "BUCHANANS" (a Scottish confectioners established in 1856 apparently)… . Could that be a diminutive human peering-out from the pub door-way? "TEAS"? - How very civilised. Ah yeah, in those days, every telephone was connected back to the local exchange with its own individual, pair of wires. The development and deployment of 'multiplexing' (frequency division) technology eventually addressed that issue - allowing multiple conversations to be passed down a single pair of wires - minimising the depletion of the planet's reserves of copper - and avoiding the need for an unsightly 'tree' atop telegraph poles. A thoroughly ignominious fate befell the public house - The Vine is now an Indian Restaurant. The iconic clock tower of Thomas Clutterbuck's Stanmore Brewery lurks on the left. The image (originally on a 'half-tone' postcard) was forwarded by Keith Salmon - thanks Keith - you're a champion! Stanmore Hill, October 1919 - looking north from the junction with The Broadway at the foot of the hill. "I shouldn't loiter in the road, if I were you, chaps". After its three quarter mile descent, one hopes that '142', B-type omnibus, has reliable brakes. Yet another image forwarded by history fanatic, Brenda K. Kock née Hegan. pages: 5, 6 - kindly contributed by Susan Johns and featuring the announcement of her parent’s marriage. pages: 1, 2, 3, 4, 5, 6, 7, 8 - contributed by Susan Johns and featuring the announcement of her baptism. Front cover, advertisements, "Births, Deaths" etc. featuring Chris's baptism, back page advertisements - contributed by Chris Cartwright. LITTLE STANMORE parish in modern documents is always alluded to as Little Stanmore, alias Whitchurch. Under the Middlesex Review Order, 1934, this parish was included in the Urban District of Harrow. The church rectory and adjacent houses are popularly known as Whitchurch. The church of St. Lawrence is an edifice of brick in the Italian style, and consists of a nave, south porch and western tower, erected about 1550, containing one bell. On the north side is a mortuary chapel (built by James, Duke of Chandos, and now belonging to Earl Temple as heir of the last Duke of Buckingham and Chandos); the present nave was built about 1715, in the same style as the Palace of Canons: the decorators and artists employed on the work were the celebrated wood carver, Grinling Gibbons, Pupils of the Verrio School and Belluci and Laguerre: the ceiling of the church is divided into compartments, each containing an illustration of one of Our Lord’s chief miracles: the walls are covered with figures of the Evangelists, also of St. Peter and St. Paul and the three Christian graces, and on either side of the altar are representations of "the Adoration by the Shepherds," and "the Descent from the Cross," by Belluci; these paintings were restored in 1935: the organ, built by Bernard Schmidt, was rebuilt and enlarged in 1878: in 1913 it was again rebuilt; the original keys upon which Handel played, consisting of only three octaves, with black ebony materials and inlaid sharps, were reinstated in their original position in the organ case: the case is adorned with two groups of cherub heads by Gibbons’ own hand; on either side of the organ are paintings of "Moses receiving the Law" and of "Our Lord delivering the Sermon on the Mount," by Antonio Verrio: Handel was for three years (1718-21) chapel master at the Palace of Canons, and organist of Whitchurch, and his Aeis and Galatea, the Chandos Anthems, the oratorio of Esther, were performed on the organ here for the first time, and two Te Deums were produced during this period: the mortuary chapel constructed over the family vault is also decorated with wall paintings by Verrio and contains the remains of more than 60 members of the Brydges and Grenville families; the memorials include a fine monument to the Duke of Chandos, who died at Canons, 9th Aug. 1744, with his statue in Roman costume, between kneeling effigies of Mary (Lake), his first wife, and Cassandra (Willoughby), his first duchess and second wife: here also was buried his second duchess Lydia Catherine (Vanhattem), who died in 1750: the monument room was restored by the Duke of Buckingham and Chandos in 1865; no burial, however, has taken place in this chapel for many years: at the west end of the church is a gallery, the ceiling of which is adorned with a copy of Raphael’s Transfiguration, by Belluci: there are some stained windows illustrative of the works of Handel: the gravestone of William Powell, the Harmonious Blacksmith, in the churchyard, is carved with representations of an anvil and hammer and the musical notes which form the running bass of the melody called “the Harmonious Blacksmith”: the edifice was restored in 1865, and was again restored by a former rector, the Rev. H. E. Robinson M.A. : there are some stained windows illustrative of the works of Handel; it has 150 sittings. The register dates from the year 1558. The living is a rectory, net yearly value £402, with residence, in the gift of the Bishop of London, and held since 1932 by the Rev. Frank Cooper.